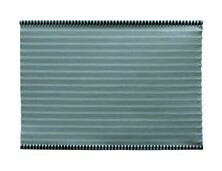 Made from glass fibers 0.6~3mm in diameter by wet process, Absorptive Glass-Mat (AGM) Battery Separator for Valve-Regulated Sealed Lead Acid Batteries are characterized by good acid resistance, high porosity, small pore size, high liquid absorptivity and low electric resistance and capable of preventing short circuits and absorbing needed electrolyte. The free passages provided by them enable oxygen to be re-compounded into water on the cathodes so that no water refilling and maintenance are needed in use. Glass fiber battery separator is composed of the glass fiber mat and glass fiber wool. 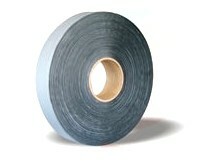 It has the advantages of low electric resistance, better mechanic strength and vibration resistance. Fixed with glass fiber battery separator, the battery possesses the stronger starting power and longer lifetime so that it is more suitable for the auto-battery and motorcycle-battery. The property data of glass fiber battery separator meet all the specifications the specifications detailed in JB/T 7630.1-2008, a mechanic industry standard of the People's Republic of China. Microporous polyethylene (PE) separator is the abbreviation　for the　microporous　polyethylene separator which enjoys　the markedadvantages over its predecessors(like PVC andAGM separator). With the performance of smaller pore size, higher　porosity, high chemical purity and high oxidation, it　can　work　properly　in the temperature　range　of -40℃~80℃. PE　separator can be in sheet and pocket size and applied on starting　battery, deep-circuit battery, industrial battery and maintainer-free battery. With the glass fiber mat frame, PE separator possesses the excellent anti-vibration for rough road. 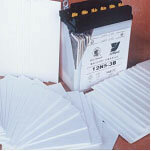 Fiberglass separator sheets for lithium cells are made from fiberglass and binder. These sheets have advantages of high liquid absorptivity, low specific resistance, excellent chemical stability and high mechanical strength, etc. They can absorb all electrolytes uniformly onto themselves and stabilize the discharge performance of cells. 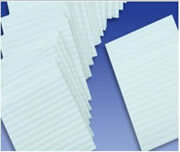 Polypropylene (PP) separator can be in sheet, pocket, and ribbed separator. With the special melted polypropylene fiber three-D structure (diameter 1-10μm), it possess the low resistance, high porosity rate, then can prolong the battery life. Polypropylene separator, as the soft type separator, has the excellent flexible suitability with the plate and prevents the active material’s drop. Made by advanced technology, sintered PVC separator is using PVC resin as main raw material for making automotive and motor vehicles. Typically, sintered PVC separator offers the minimum 38% porosity, with maximum pore diameters of 25 microns. 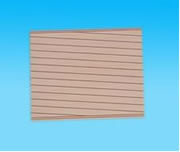 To increase the ability of vibration resistance, Sintered PVC separator also can combine with the glass fiber mat. 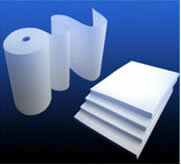 Glassfiber mat, cotton, anti oxidatio oil, barium sulfate, cork powder, ... ..